Vintage 1953 photo of Alberto Ascari at the 1000 KM Rennen Nurburgring. 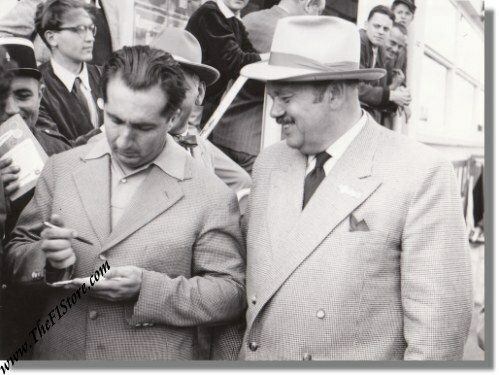 This is a vintage 1953 photo of the great Alberto Ascari signing autographs after his win in the 1953 running of the Nurburgring 1000 KM race. Alberto was partnered with Giuseppe Farina for this race and the duo drove their Ferrari 340 MM (375 Plus) Vignale Spyder S/N 0286AM to the overall win with a staggering lead of 15 minutes over the second placed Jaguar C Type (S/N XKC 041) of Ian Stewart & Roy Salvadori. The car survives to this day in the USA. The photo measures some 16 x 12 cm or 6 x 5 inches.